People have called me crazy for a lot of things…but keeping backyard chickens in the middle of Dallas seems to have really pushed people over the edge. But I’m definitely not alone anymore. Newbie vegetable gardeners are coming out of the woodworks and the backyard chicken movement continues to gain momentum. There is no reason that us city dwellers can’t or shouldn’t grow and raise some of our own local food as part of a sustainable way of life. Vegetable gardening, composting and raising small livestock are vital components of a healthy lifestyle, not to mention a healthy community. Per the recent Report of the Council on Science and Public Health put out by the American Medical Association, creating local sources of organic, natural and sustainable food sources is key to public health in America. Raising backyard flocks of hens for fresh egg production is part of a sustainable food system. Knowing exactly where your food comes from is comforting, to say the least. Knowing how your food is treated while it’s alive is even better. Because eggs are my primary source of animal protein, it’s important for me to know the chickens that produce them have a happy and healthy life. Keeping and caring for my own chickens is the best way for me to ensure they do. It also enables me to control what goes into the eggs I eat by what I feed my chickens. Chickens love to eat grass, greens and forage for insects and worms. When they get a natural diet, plus lots of healthy sunshine, the result is fresh, tasty and highly nutritional eggs that you can feel really good about eating. There is a big difference between a store-bought egg and a farm fresh egg. Factory farmed chickens are confined to small spaces with no access to the outdoors. Precious sunlight and foraging are not a part of their lives. They are fed grain feed and the nutritional value of their eggs reflects this circumstances. Our options at the grocery store have gotten better now that stores carry more organic and free-range eggs. However, even chickens raised in large scale “organic” or “free-range” operations may be confined with limited outdoor access for a majority of their life. As a result, a typical grocery store egg tends to be somewhat runny with a pale yellow yolk. In contrast, crack open a “yard egg” and you’ll find dense firm white and bright orange yolk. Yard eggs typically contain 25 percent more vitamin E and a third more vitamin A. That beautiful orange color comes from extra 75 percent beta-carotene found in yard eggs. They can also contain significantly higher levels of omega-3 fatty acids than factory farmed eggs. Flavor is also a big factor. If you’ve never tasted a farm fresh egg, you’re really missing out. You’ll find fresh backyard eggs will have a nice hearty flavor and a much denser consistency than store bought eggs. Store-bought eggs aren’t as fresh as most of us would like them to be; days or even weeks old is common. As the eggs age, air penetrates the shell, which breaks down the flavor, nutritional content and consistency of the egg. Whether you started out growing your own organic vegetables and now want to add chickens to your backyard garden, or vice versa, the two go together like peas in a pod. Once you throw in composting, which is a must if you’re gardening, you can get pretty close to what I like to call a close-looped system. You and your chickens get fresh veggies from the garden, then the leftovers and expired crops go into the compost. All the waste from your chicken coop, such as old bedding and manure, go right into the compost as well. The finished compost becomes an excellent amendment for your garden beds. Waste not, want not. Chicken manure is one of the best natural sources of Nitrogen and makes an excellent fertilizer especially for vegetable gardens. Unlike dog and cat feces, which contain E.coli and can contaminate city water sources and your vegetable crops, chicken manure does not. It can be composted and reused in the garden. If you’ve ever struggled with getting your compost to break down quickly enough, you’ll find chicken manure to be just the jump-start you need. Did I mention that keeping your own chickens is also a lot of fun? 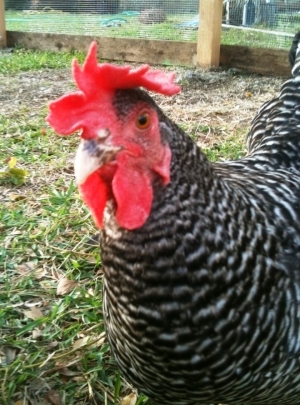 You’ll find each breed and individual chicken to have her own distinct personality. They’ll quickly become just as much a part of the family as your favorite dog or cat. As a bonus, these gals will make you breakfast every morning. 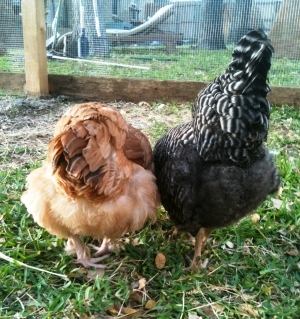 Keeping backyard chickens is a great outdoor family activity. Plus, it teaches kids where their food comes from. Daily maintenance takes only about five minutes, but you’ll find you want to spend much more time with your birds. Hens are relatively quiet and there is no reason for a coop to be dirty or smelly. Spend about 30 minutes a week tending your coop and you won’t have such problems. When you care for your urban flock responsibly, raising backyard chickens can also be a great way to bond with neighbors and community. The deal with my next-door neighbors? They babysit, they get the eggs! If you’ve been thinking about keeping backyard chickens but haven’t yet taken the plunge, here are a few things to consider. Do your research and check animal ordinances in your city. The city of Dallas only has one restriction: No Roosters. Other cities have different restrictions so you need to make sure you’re in compliance with code. No, you don’t need a rooster to get eggs. Hens will simply lay unfertilized eggs for you to harvest. Keep at least two birds, as they are social animals. You’ll need to buy or build a dwelling that offers about 2-square feet of roosting space per bird and at least 4-square feet of ground or “run” space per bird. Keep in mind we have lots of hawks in North Texas. Providing a covered run is the best way to protect your flock from predators. Once of age, hens can lay an egg a day depending on the breed. Production usually tapers off after several years, but that also depends on the breed and health of the individual bird. Chickens can live up to 8 to10 years in a well-tended backyard flock, so be prepared to keep birds as pets once they’ve stopped laying. 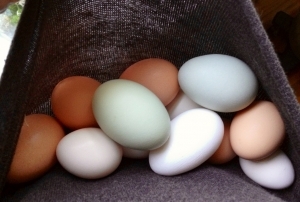 Attend local programs and club meetings to learn all the ins and outs of keeping a successful backyard flock and you’ll be on your way to fresh yard eggs in no time.